In the latest Lesbian Book Club podcast, I get to interview international smash-hit author Eliza Lentzski of ‘Winter Jacket’ and ‘Don’t Call Me Hero’ fame. Eliza discusses living in the Milwaukee and her love of cheese, her writing journey from fanfiction to No.1 best-seller, as well as the ongoing success of her Winter Jacket series and why she owes it all to Judy Blume and Jane Austen. I also do a run-down of the Lesbian Romance charts, speak about appearing at this year’s LFest and Brighton Pride and finally, read from my upcoming novel, This London Love. Episode six of The Lesbian Book Club sees me having a chat with Katie-Bennett-Hall of Planet London and Planet Of The Books fame, and she fills us in on what it’s like to be a book reviewer in the lesfic world. Katie has some great advice on what to do and what not to do if you have a book you want reviewed, as well as telling us about her upcoming projects including a new web series. I also chat chocolate and Easter, as well as filling you in on what’s going on with my upcoming novel – it’s currently with first readers, the cover is being designed and I’m also dabbling in the world of audiobooks. Hope you enjoy it! Episode five of The Lesbian Book Club sees me having a natter with author Karen Campbell about her books so far and her busy upcoming year, where she plans to put out at least two books, possibly three. She’s a book machine! As well as chatting to Karen about her writing, ghost-hunting, football and her most annoying habits (OCD, according to her girlfriend), I also lament the anti-climax of last week’s solar eclipse and give you a run-down of what’s flying high in the US and UK Amazon Lesbian Fiction charts. Fill up your ears! Episode Four of The Lesbian Book Club sees me interviewing author Amy Dunne about her two novels and her upcoming book The Renegade, as well as rounding up what’s moving and shaking in the Amazon Lesbian Charts. It’s a delicious aural cocktail – fill your ears today! I’ve been a bit slack putting this one up, so apologies! Here’s my interview with US award-winning author Cindy Rizzo who talks about her writing, living in New York and why she’s gone from being self-published to signing with a publisher. Treat yourself to this podcast today, hosted and produced by My Lesbian Radio. My two novels London Calling and The Long Weekend are both available now. I’m thrilled to announce that I’ve teamed up with Denise at My Lesbian Radio to host a new podcast, The Lesbian Book Club. I’ll be interviewing authors and discussing trends and new releases in the world of lesbian fiction, as well as just having a right old gas about books. The first episode is live and clickable above, and sees me interviewing author Angela Peach about the upcoming UK charity lesfic anthology L Is For… Listen up & listen now! For more awesome shows from MyLesbianRadio including an interview with Diva’s editor Jane Czyzselska, head here. 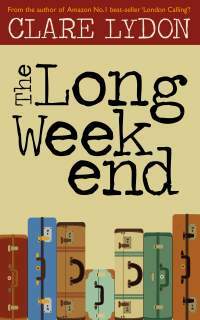 My new novel The Long Weekend is out now and available from Amazon by clicking the links below.